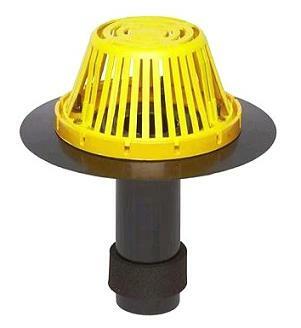 CONSTRUCTION: Drain consists of a molded ultraviolet stabilized polyethylene or cast aluminum dome strainer, a cast aluminum epoxy coated gravel guard and clamping ring, 10" O.D. injection molded ultraviolet stabilized black ABS drain flange with top rib flashing lock. The outlet pipe has a pre-compressed modified asphalt impregnated expanding foam, sealing tape, having a temperature range of -40 F to +185 F and 150% minimum elongation.